The Ark, located in Poole Park, Poole in Dorset is a family favourite in the town as a result of the award-winning leisure activities it offers families – no matter what the weather holds. 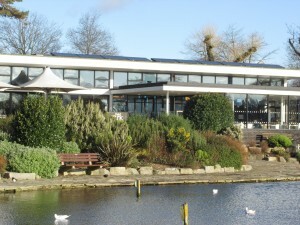 A soft play area for children up to eleven years old, an ice-rink and a cafe over looking the lake and more, it is no surprise it is so popular. However, with these and other activities comes high energy bills and that is why the company contacted NGPS Limited who fitted a solar panel system In January. The Arc has been fitted with 96 SolarWorld panels, each with its own Enphase micro-inverter for added energy generation, by as much as 15% per panel. The micro inverters also enable hour by hour generation reports via a free downloadable App. The installation was carefully considered, given the location and its popularity with the local wildlife. Even though the panels are self-cleaning, a walkway has been created through the centre to offer easy access should it ever require added cleaning support. Keeping Brittany Ferries Energy Generation Afloat! 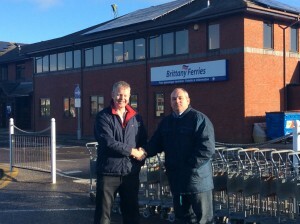 NGPS is pleased to have installed a 20 kilowatt solar panel system at the Brittany Ferries facility in Poole, Dorset. The company is now the proud owner of a SolarWorld energy generating panel system, distributed across five roof positions to maximise energy generation. Pictured, you can see three installations on the front of the building. Each solar panel benefits from up to 15% increased energy generation as a result of individual Enphase micro inverters. Enphase also enabled the fitting of panels split over a multiple roof space, and were fitted as standard rather than the usual premium for this product. Brittany Ferries were delighted with a more than anticipated energy saving prediction, which they will receive on top of the government’s 20 year Feed in Tariff paid for every kilowatt hour generated, and from the 50% energy generation payment from the energy supplier. They were also delighted to see just how quickly they had generated enough energy to power a lightbulb for 51 hours! Pictured: 2 installations on the back of the building. Brittany Ferries has the widest options for Cross Channel Ferries leaving from 3 UK Ports, including Portsmouth, Poole and Plymouth. Routes to France include Portsmouth to Caen, St. Malo, Cherbourg and Le Havre, Poole to Cherbourg and Plymouth to Roscoff and St. Malo. With routes to Spain and Portugal also available.